Richard Lewis Photography Tuition: Adapting the Adaptor! Blog > Adapting the Adaptor! In the world of photography each manufacturer still works to their own standards and in particular the lenses (or lens mounts) are in most cases not cross compatible from brand to brand. Of course there are many benefits (mostly commercial) to the manufacturers having this lack of cross compatibility; I’m not going to list them here. Just to add to the confusion the world of photography has changed from ‘Film’ to ‘Digital’ which because of the differing dimensions of a 35mm ‘Film Frame’ compared to the dimensions of ‘Digital Sensors’ (which all vary slightly, i.e. several variants of ‘APS’ size sensors and come in different sizes as well) means that manufacturers Lenses behave differently in terms of optical focal length if they have been designed for use with either Film or Digital cameras (unless you’re using 35mm film lenses with ‘Full Frame’ digital cameras). Over the years even the bayonet fittings for lenses of a single manufacturer have changed for some manufacturers due to technological advances. So if you want to purchase a lens second hand of a particular brand that was designed for use on a ‘Film’ camera of the same brand for your digital camera you have to check the technical spec in your camera manual to see if the bayonet fitting is compatible, in most cases it probably will be, however another consideration is the lens from a film camera will probably have different focal length because the sensor in your camera will be smaller in most cases than the 35mm film frame, hence the ‘Crop Factor’, so a simple multiplication gives the new Focal Length. 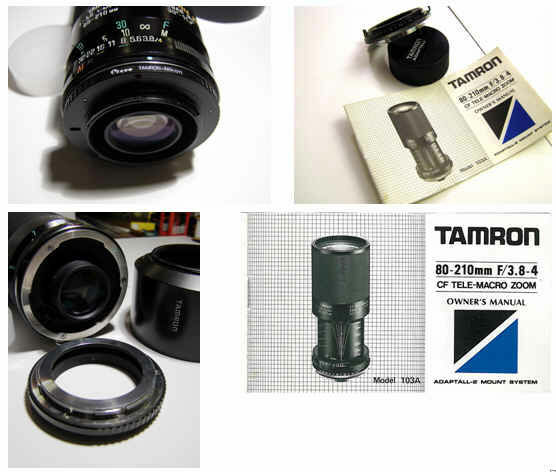 There is however one exception to all this incompatibility, back in the days of Film Cameras ‘Tamron’ who didn’t produce Cameras, but manufactured lenses for the major camera manufacturers with adaptors to fit various bayonet fittings of the time, this was known as the ‘Adaptall’ system, and many of these lenses are available today second hand, the Lenses are good quality and well made. Last year I purchased one with a Pentax ‘K’ fitting, the lens is an 80-210 zoom, f3.8/4, I don’t have a Pentax camera so it’s been sat in my cupboard for 12 months in its case with the instructions & lens hood, it’s like new but cost only £12.00. that’s what happens when you browse e-bay on a rainy afternoon. Reading about ‘Adaptall’ mounts on the web and looking through my camera manual it occurred to me that with the purchase of an ‘Adaptall II’ to ‘Nikon’ adaptor, that in theory this lens could be used on my Nikon mount camera, so taking a bit of a risk I ordered one such adaptor from a supplier in ‘Hong Kong’, (not a genuine Tamron) the risk being the loss of £10.90 (not much of a risk really, price of two camera mag’s). The good news is the lens with said adaptor works fine on my Fuji with the Nikon lens mount, confused? My ‘Fuji’ camera lives inside a ‘Nikon’ camera body (collaboration between manufacturers! ), so I have a lovely 80-210 zoom lens which with the 1.5x Crop factor behaves as a 120mm to 315mm Zoom lens for just £22.90 what a bargain.